Combining cuisines can be risky business, but using an all-rounder like rice as a foundation opens doors to a whole host of flavours. Discover why more chefs are moving away from the rigid rules of authenticity and take a look at two incredible recipes that bring together ingredients from all over the world – with delicious results. In the UK, we’re spoilt for choice when it comes to worldly flavours. Our multicultural society is reflected perfectly in our nation's kitchens and restaurants, where we can find French, Italian, Chinese, Indian and Japanese dishes that are truly world-class. While Italy is where you'll find the very best Italian food and Thailand will have unsurpassable Thai cuisine, it’s much harder to find restaurants serving quality non-native dishes in those countries like you can in Britain. Perhaps that’s why chefs feel they have the freedom to experiment with and push the boundaries of specific cuisines here. As well as opening restaurants which tick the authenticity boxes, many are now cherry-picking the ingredients and flavours they love and combining them without worrying whether they’re traditionally paired together or not. This is having a trickle-down effect in the home, too, with cooks starting to look beyond the rigid rules of traditional cuisine and experimenting with worldly combinations instead. While we’ve never been too concerned with true authenticity (just look at dishes like spaghetti Bolognese, chicken balti and crispy duck pancakes; three things which are all but unheard of in Italy, India and China), we’re now combining flavours of the Middle East with European cooking methods or using Indian spices in traditional British dishes. Of course, sometimes these experiments with fusion cooking simply don’t work. Specific cuisines often have strong, bold, unmistakable flavours that can easily clash with one another, and it takes plenty of culinary experience to be able to balance them in a dish. That’s why it helps to have a base ingredient that can absorb and take on flavours rather than fight with them – and rice is the perfect candidate. Subtle yet aromatic and well-suited to taking on the flavours of spices, herbs, sauces and dressings, rice is a fantastic starting point for any fusion food dish. It allows us to get creative in the kitchen, acting as a base for all manner of ingredients from all over the world. There are all sorts of varieties to choose from each with their own characteristics, and there are even blends that combine them with other nutritious, flavourful ingredients such as quinoa or sunflower seeds – adding yet another point of fusion-led difference to your cooking. Being a staple in many Asian and Middle Eastern countries means rice is particularly well-suited to marrying cuisines from across those nations, too, where some of the most flavourful, colourful and exciting cooking can be found. 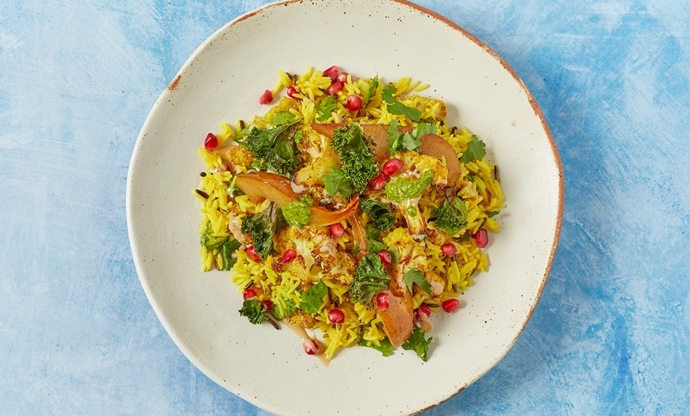 To see what we mean, take a look at the two incredible recipes below – which feature top-quality basmati rice combined with wild rice and smoked quinoa – to see why. This vibrant, colourful salad is a masterclass in fusion cooking, with each individual element bringing something unique to the dish. At its base is a combination of basmati and wild rice, which is flavoured with cinnamon and saffron (spices widely used in Middle Eastern cooking). 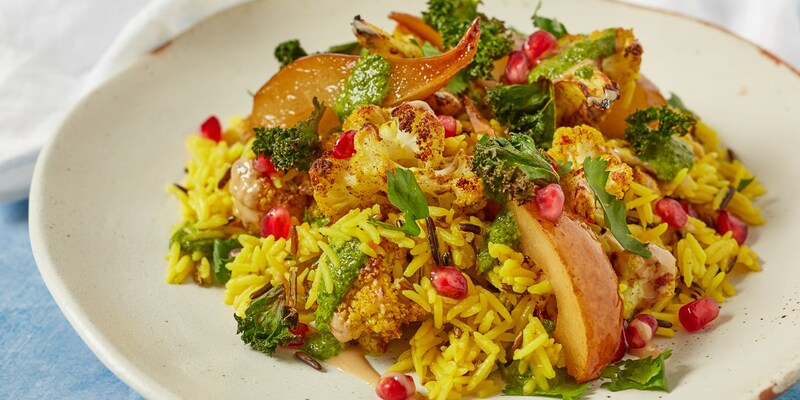 On top of that, there are florets of Indian-spiced cauliflower roasted in coconut oil, as well as pears roasted in pomegranate molasses (Middle Eastern), verjus (French) and New Zealand’s famous Manuka honey. For crunch there’s crispy kale flavoured with chaat masala (Indian), while a green zhoug sauce from Yemen and a Middle Eastern tahini cream are used to dress the dish. A scattering of pomegranate seeds and herbs on top add yet another pop of colour. 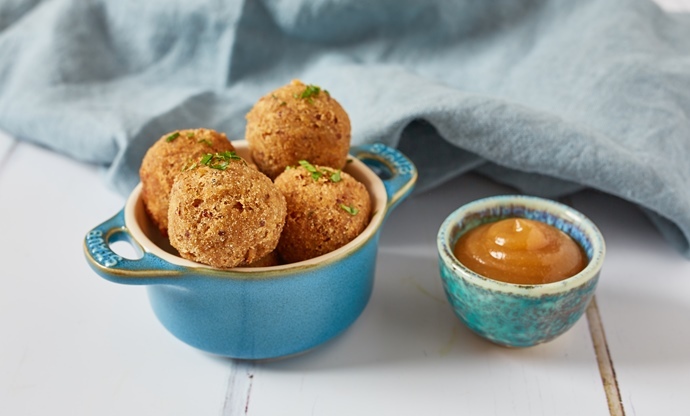 A unique take on the arancini of Sicily, these deep-fried balls of rice, quinoa and mozzarella are served with a sauce made from Granny Smith apples (from Australia) and ajwain seeds (India). The balls themselves see the Middle Eastern spice mix baharat, Spanish paprika and Asian fenugreek seeds used to flavour a combination of onion, garlic and ginger before being combined with Indian basmati rice and smoked quinoa from South America. This mixture is then formed around cubes of Italian mozzarella before being dusted in polenta (also Italian) and deep-fried. The result? An incredible snack or starter that’s unlike anything else you’ve tasted, fusing several very different cuisines together seamlessly. Donburi is a classic Japanese dish that sees a variety of different meats, fish and vegetables served on a bed of rice. This recipe stays true to the authentic recipe but contains a few worldly twists that make it really stand out. 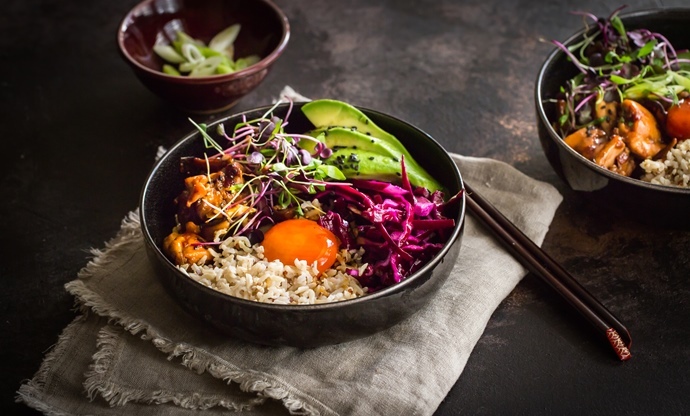 The brown rice is mixed with South American quinoa for added texture and crunch; the chicken marinade contains a little Canadian maple syrup for sweetness, there’s a sliced avocado on top for creaminess and some crunchy pickled red cabbage – a classic British preserve – to add freshness. As you can see, breaking the rules of authentic cooking and combining ingredients, flavours and techniques from all four corners of the world can lead to some absolutely stunning dishes. Using a catch-all ingredient such as rice, perhaps mixed with a few other grains, provides a fantastic canvas for adding your favourite flavours to, paving the way for some very unique pairings that you can truly call your own.